One of the places I want to visit and I am very sceptical is Palestine and Jerusalem. As an ex-Christian and now Muslim I do have a strong connection and I would love to visit. One thing that always stops me is the treatment I will receive at the border, I have heard some horror stories. So I took up to find a Muslim couple that has been to Palestine and share their experience with us. The post is a guest post from the lovely Something to Declare blog, make sure you check out their website for more cool stories. Palestine offers so much more. Beyond the violence, oppression, and politics, that has, unfortunately, become what people associate with this country Palestine is a truly beautiful country. It has a rich history, kind people and stunning terrain and has something to offer every tourist who is willing to look beyond the headlines. There are thousands of reasons to visit Palestine and it should be in every Muslims bucket list. Here are just a few of the many reasons why you should visit Palestine. 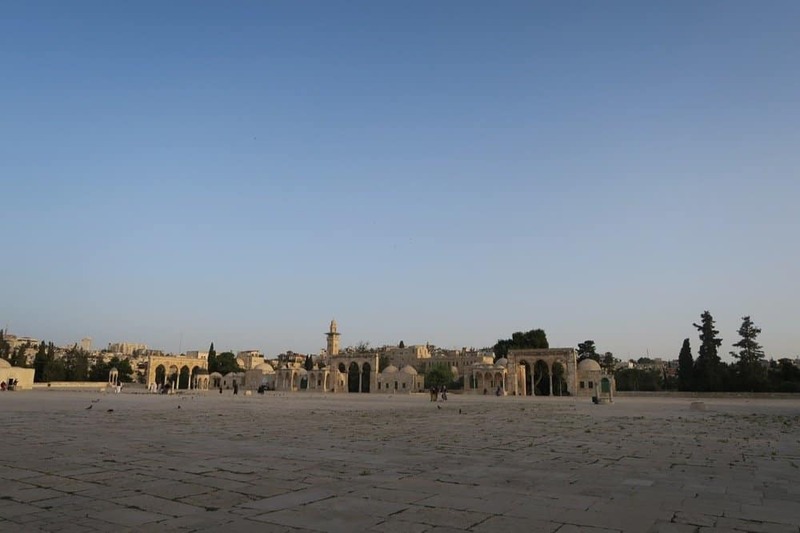 Jerusalem can be a very tense place, with heavily armed Israeli soldiers and citizens everywhere, but Haram esh-Sharif (Temple Mount) was surprisingly one of the most peaceful places we have ever visited. 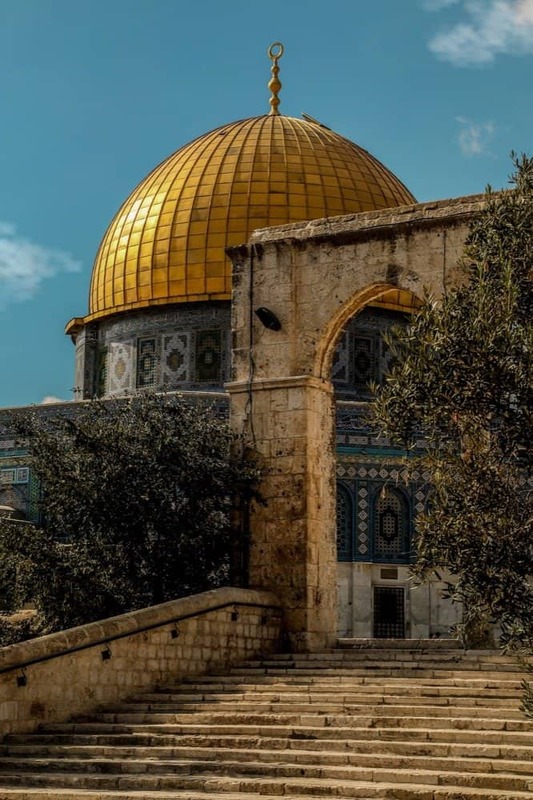 Encased in a large square with kids playing football, family picnics, newly engaged couples walking hand in hand lies the dome of the rock mosque and the al-Aqsa. The experience of hearing the adhan bellowing out over the square from the mosques is indescribable and could probably move even the most sceptical cynics. Nablus is one of the nicest places I have ever been to. My dream is to go and visit the old city of Damascus and they say Nablus is modelled on Damascus. It is a stunning place with one of the most beautiful Old Towns I have ever been fortunate to visit – walking around the old town you can feel the influence of the Ummayads and the Ottoman Empire all around you. Being invited into people’s homes, families and communities to share their experiences and eat their food – which is divine, by the way – just shows you the kindness of the people we met at every stop on our trip. They admire travellers who have taken the time to visit Palestine and want to make your trip nothing but perfect. 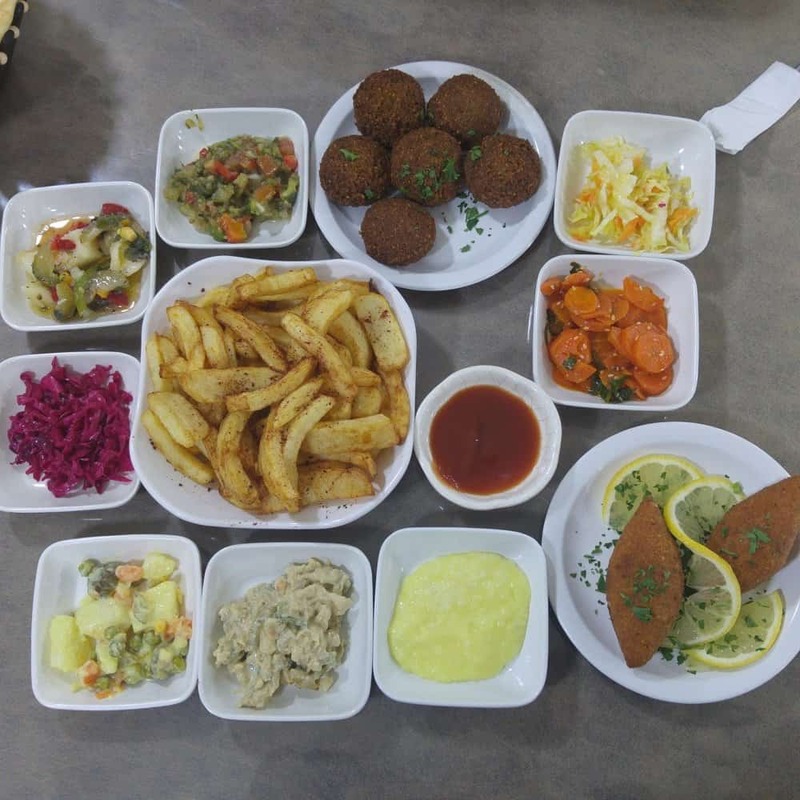 In most places we would think it is a hustle if a random person invites you round to try some home cooked food or advises you to go to this place or restaurant but in Palestine it never was – you learn to leave your cynicism behind and go with the flow- they just want people to see the real Palestine. Their stories are funny, honest, raw and tragic but always full of hope, something I found hard to understand but admired nonetheless. Visiting Palestine (The West Bank) is not difficult but it does take a little more research and prep than your average trip. We have written a dedicated post on the logistics of visiting Palestine which addresses frequently asked questions as well as any security concerns you may have – read this here. Once in Palestine, there are literally hundreds of things to do, from historic trails to cable cars. Here is our top 5 list of things you must do when visiting Palestine. 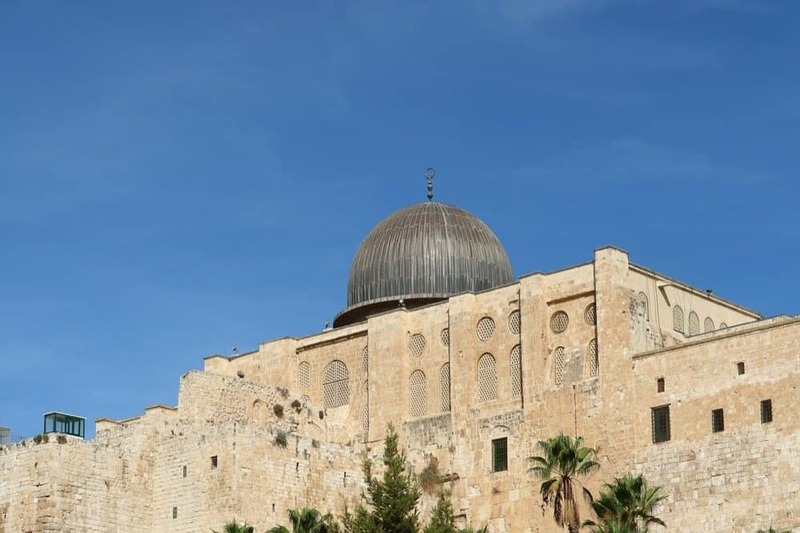 Visit Haram esh-Sharif (Temple Mount) – Dome of The Rock and Al Aqsa Mosque. As a Muslim, this was the top of our list. Visiting this iconic mosque was just something else. The beauty and peace of the place really moved me. Take the cable car in Jericho. This cable car is located in Jericho and goes up Mount Temptation – where Jesus was said to be tempted by the devil. It is a stunningly breath-taking view. Get lost in the old city of Nablus. A stunning old town with winding old streets and great food. Walk around, take a tour around the old city and just get lost in this beautiful old city modelled on Damascus. Make sure you eat some world famous Nablusi knefah! Bethlehem and the Birthplace of Jesus. A visit to the Church of Nativity in Bethlehem cannot be missed. It is a very surreal place in a lovely town with some great falafel restaurants. One not to miss is Afteem restaurant right opposite the Church of Nativity which has been around for over 60 years. Visit Ramallah the de facto “capital city” of Palestine. Visit the busiest city in the West Bank and watch, see and feel how people and the city just keep on going under occupation. There are some really swanky and nice cafes located over Ramallah and some great food. Make sure you try the Shekshuka and Chicken Sharawama sandwiches. These were the best I have ever tasted. So what are you waiting for? Make Palestine your next destination and spread the word! As a Muslim too, I’d love to visit Palestine but what’s the best way to get there and getting around? I think it is mostly summing up the courage and visit. Once you get through security it is pretty easy to move around.